August 16-19, 1999. Midlife continued to have his paint stripped off his poor old body, and some bondo was found, not surprising. We did come to understand why the front bumper guards had such big gaps from the valence: the car was in a 'bender, and the supports at the top for the valence were way out of alignment. 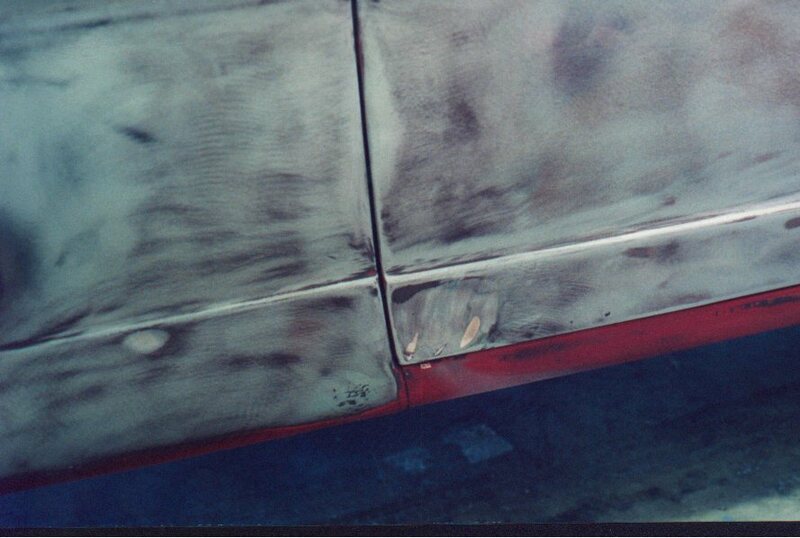 The cancerous rust along the bottom of the doors, front fenders, and left rear wheel well were extremely minor, and sanded almost right out. Last friday, I was recommended to get a new hood, preferably an old Ford version, possibly for $100. 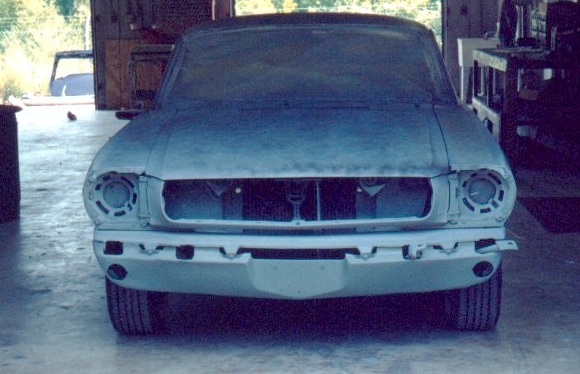 Sure enough, I found four to choose from, and I chose the one that had its top stripped and showed no bondo. 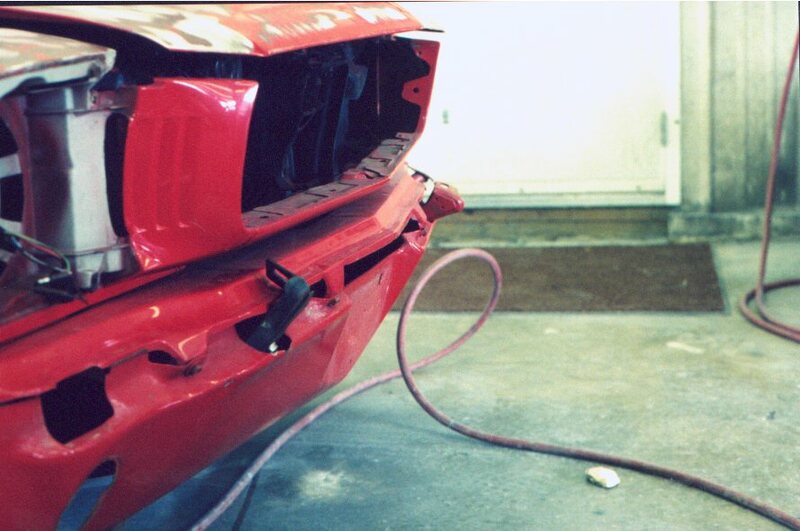 Apparently, bondo and hoods don't mix well, due to the heat. 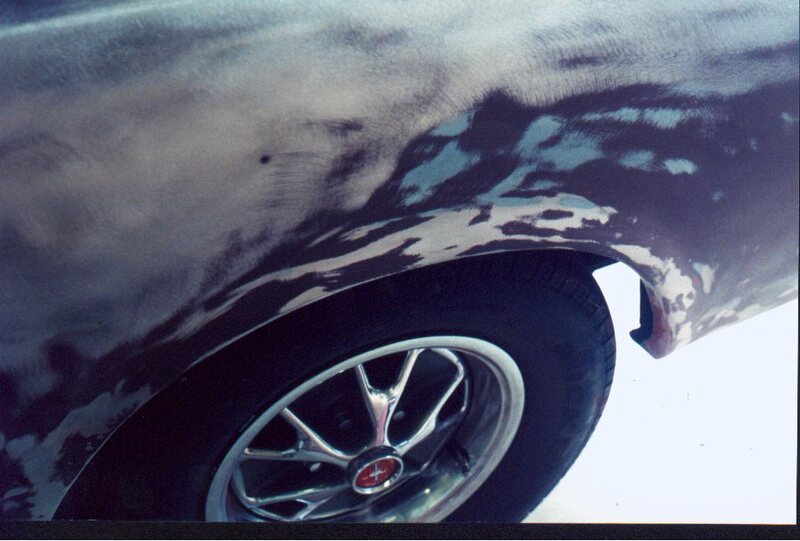 My existing hood had bondo near the front lip, probably from the same 'bender that the valence panel experienced. Anyway, I brought the hood in on Monday, and the bodyman ran his hand over it and said it wasn't any good. 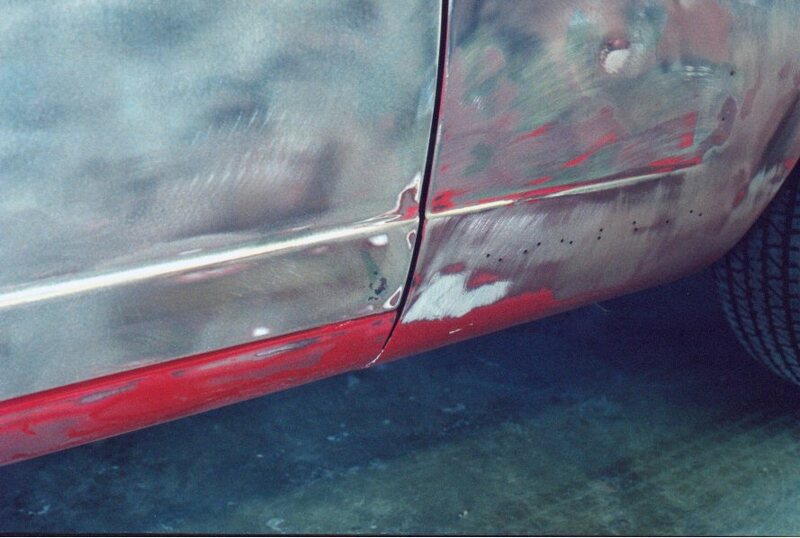 A few shallow dents that one can't see are enough to use bondo for that smooth finish. 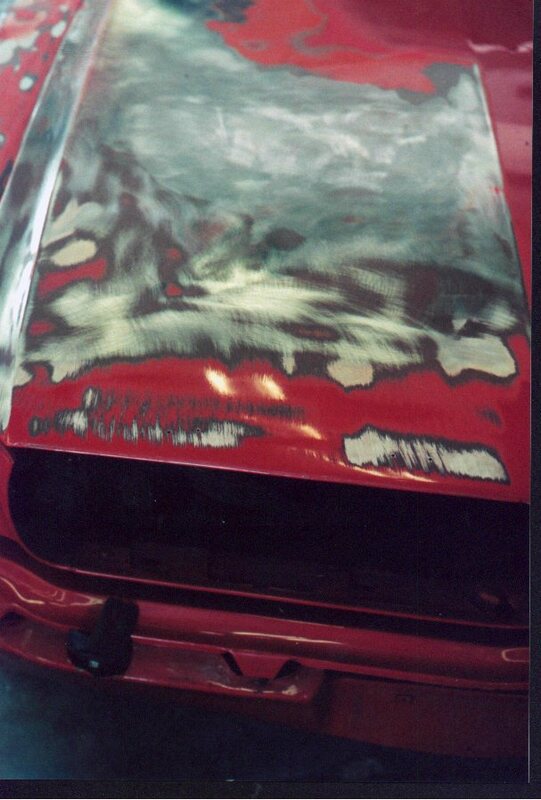 But since you can't use bondo, that hood isn't going to be used. 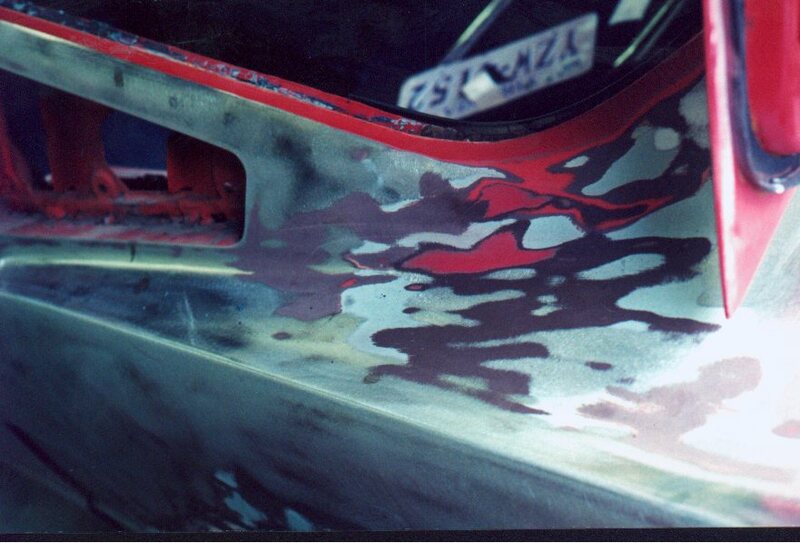 Since my existing hood lasted 8 years or so with the existing paint and no cracking of the underlying bondo, it probably will go another few years. The bodyman wants to use all of my existing sheet metal, since it all fits together reasonably well. 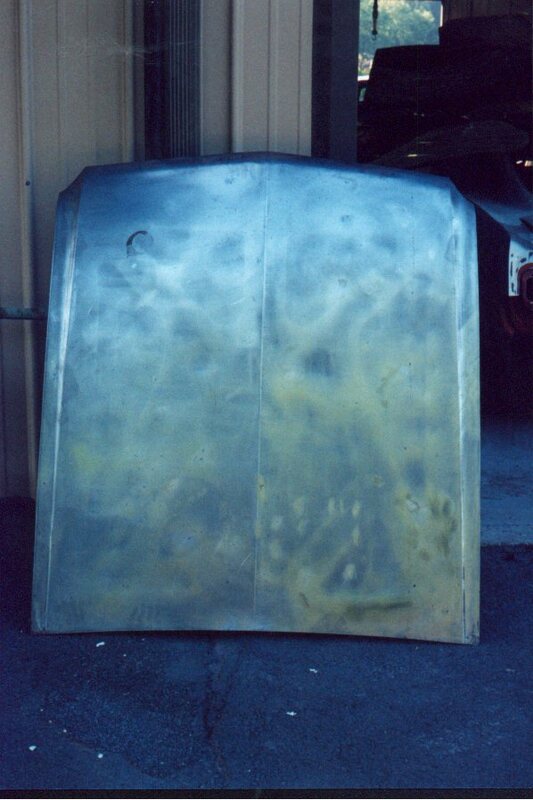 After sanding the majority of the body down to bare metal, we had some very humid days, and midlife got his first coating of primer to ward off surface rust. All of the exterior sheetmetal repair work is done, and the hard work comes: priming, painting, removing waves and inperfections, painting again, etc. Oh! A couple of good news to report! 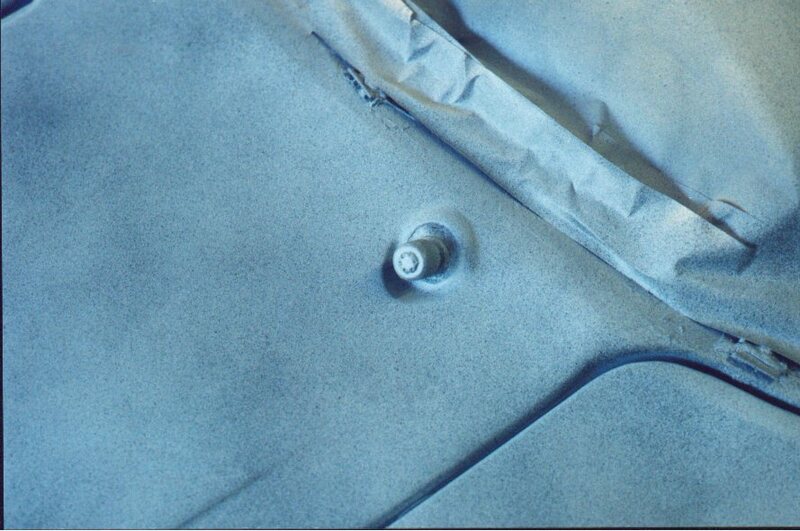 Close inspection of the cowl vents show some rust, but no holes, and the sheetmetal is still solid! Not too bad for a 33 year-old colt! Don't even have to install the plastic hard-hats. Also, a previous owner put some sort of duct seal around the windshield wiper posts to keep water out of the cowls. The bodyman removed alot of it, but thought it was a good idea to leave the seal in...couldn't hurt! Frame rail holes were due to the use of finger jacks, and now I know to to use a 2x4 between the floor jack and the rails. Finally, the difference in wheel base is due to an alignment problem, and the bodyman recommended a real old-timer who still uses a Behr machine for alignment. These pictures were taken on August 16 and 19. Click on any one of them for full size: no larger than 100kB. I'm going to be gone for the next two weeks on business, so no more pictures, updates, or web pages until after Labor Day. going on prior to sanding: click here. across the entire lip of the wheel well. 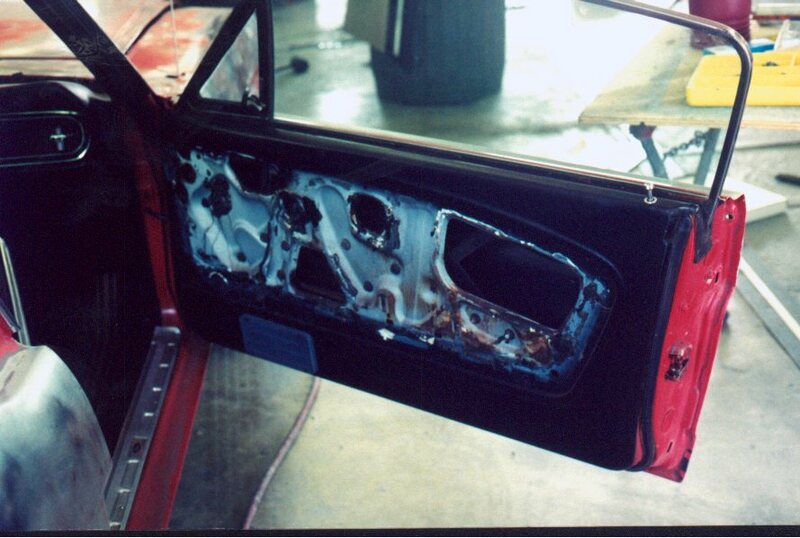 this to prior to stripping: click here. I don't have a flash unit. passenger's door. 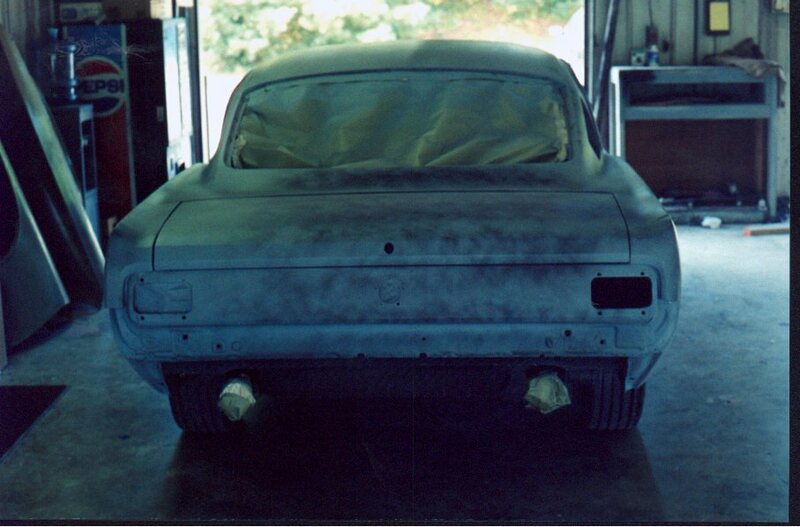 Notice the white primer. must have been beaten up a couple of times! guards. This was an easy fix. Watch out for that snake: it might bite! on the radiator will disappear. It had better! nasty shop and back on the road! the hole. It does keep out the water!